The city is abuzz with brass tunes as the air gets cooler here in Kathmandu. We have many interesting groups building different genres of music here in the city. The number of people in the band is usually limited to five or less. The members of the band work together as a team to create different nuances of the music being performed. More people working together means that he music starts to change into, more of a living thing. It feels like the many interwoven parts undulating back and forth through the scales and rhythm are a part of an organism, complex and ethereal at the same time. KJC big band has fifteen members, many of whom are playing brass instruments like the trumpet and trombone. This is one of the most largest group of musicians to perform regularly in Nepal. 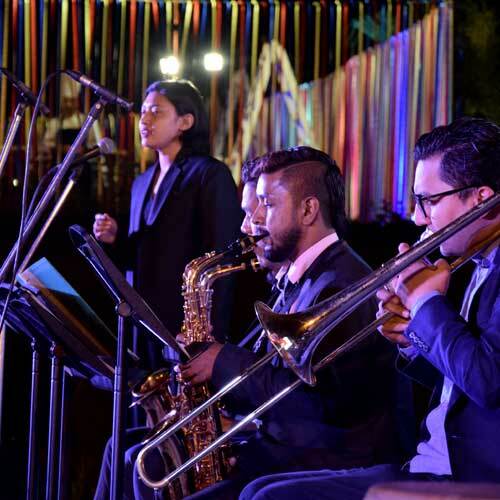 They play dancy-jazz music and are pulling off sold out shows in different happening venues of the capital like Hyatt regency and Moksh. The music is powerful and paired with our Lindy Hop dancers and their instructor Maria Lopez, it is certainly an amazing experience watching so many people behaving like they are different little parts of an intricate machinery. The fun they are having on stage is contagious. It is difficult to see many such performances in Nepal from large groups of musicians because of the sheer dedication and logistics it takes for so many people to come together regularly and rehearse. It is also difficult to see musicians playing instruments like the trumpet, trombone and saxophone in the first place because they are considered exotic here. It is unfortunate that even though music in Nepal is developing at a rapid pace, we still have much to catch up to in terms of the global music education standard. Many children never even get to hold a trumpet or a saxophone. KJC has always been backing and producing musical projects like these that are essential to show the Nepali public new ways to express themselves. Who knows? Maybe a child who is a prodigy at the saxophone is currently trying desperately to make it as a guitar player just because that’s all they’ve ever been exposed to. Maybe this child discovers their hidden potential. The KJC big band has been performing almost every month now and be sure to catch them this December around Christmas time. Call us at 01-5013554 / 9813556945 or write to us at info@katjazz.com.np to buy tickets for the show. Our students can enter for free. Contact us now!